261 pages | 99 B/W Illus. Microscopy is at the forefront of multidisciplinary research. It was developed by physicists, made specific by chemists, and applied by biologists and doctors to better understand how the human body works. For this very reason, the field has been revolutionized in past decades. The objective of Optical Nanoscopy and Novel Microscopy Techniques is to choose some of those revolutionary ideas and serve a general audience from broad disciplines to achieve a fundamental understanding of these technologies and to better apply them in their daily research. The book begins with coverage of super-resolution optical microscopy, which discusses targeted modulation such as STED and SIM or localization methods such as PALM. It then discusses novel development of fluorescent probes, such as organic small-molecule probes, fluorescent proteins, and inorganic labels such as quantum dots. Finally, it describes advanced optical microscopy, such as fluorescence lifetime imaging, fiber optic microscopy, scanning ion conductance microscopy, and the joining of optics and acoustics—photoacoustic microscopy. Following each chapter, a detailed list of references is provided. Problems at the end of each chapter are also included. "… a reference for the optical physicist, biophysicist, chemist, or just plain tinkerer who wants to design and build systems or construct probes. … For the student, one particularly nice feature is the inclusion of a list of problems to solve at the end of each chapter. These range from simple to very challenging, and any student who works through them all will gain an understanding that could never be obtained by rote learning." 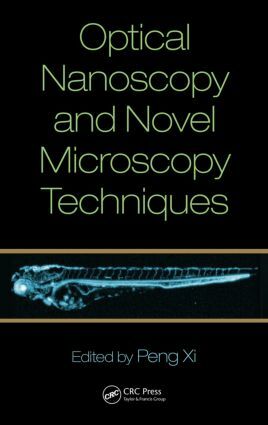 "These days, all over the world, biology labs and physicists are collaborating, looking at the rapidly evolving techniques of super-resolution and saying ‘But, hey, we could do better if we did it this way…’ This is their handbook. Then there are the tinkerers, who will read the more obscure chapters and say ‘Wow, I could use this to…’ It is their handbook too. The book is a valuable addition to the literature." Peng Xi is an associate professor in Department of Biomedical Engineering at Peking University in China. He obtained his PhD from the Shanghai Institute of Optics and Fine Mechanics, Chinese Academy of Sciences. Dr. Xi’s research interests focus on optical nanoscopy, novel applications on confocal microscopy, and biomedical optical instrumentation. Dr. Peng Xi is on the editorial board of three SCI-indexed journals: Microscopy Research and Techniques, Micron, and Chinese Optics Letters. He has published more than 80 scientific papers in peer-reviewed journals and conference proceedings.